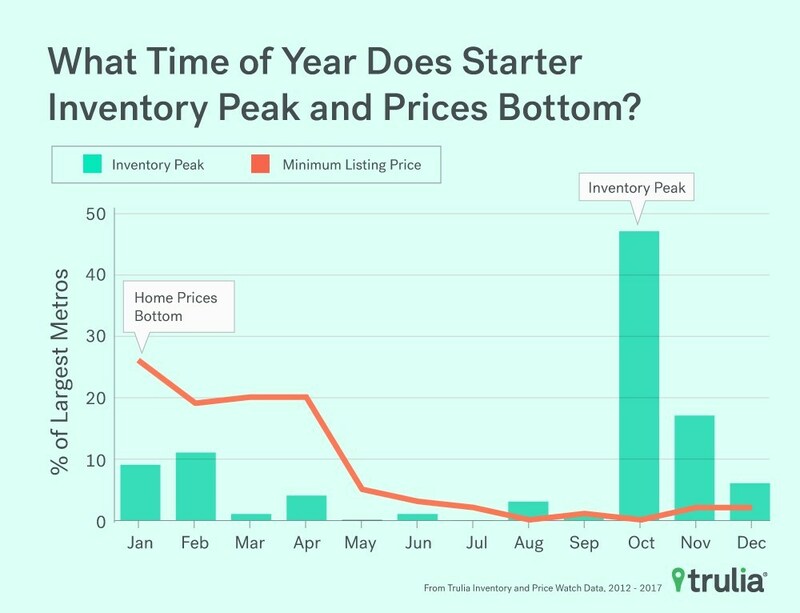 Seventy of the top 100 largest metropolitan areas see more starter homes on-market in October, November and December, relieving prices 4.8 percent over spring, according to the recently released Trulia Inventory and Price Watch. The most dramatic shifts—in favor of first-time homebuyers—in prices and supply are out West, in Arizona, California, Colorado and Oregon. Make no mistake: The housing market is still in a squeeze. Entry-level home inventory sank 20.4 percent year-over-year over the summer, while move-up home inventory shrunk 12.5 percent. Even luxury homes were at a shortage, down 2.3 percent. First-time homebuyers were forced to shell out 39.7 percent of their monthly earnings for a starter home. The change of season, still, could usher in more opportunities.